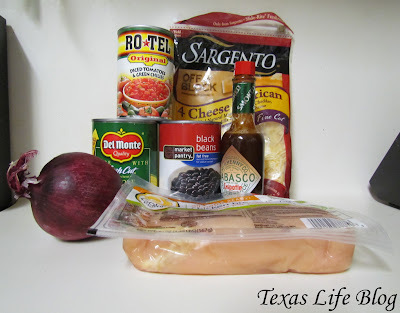 Ever since moving to Texas, our taste in food has evolved considerably. We've gone from favoring Eastern European cuisine, to dining consistently on barbecue and foods with more of a southwestern kick! Recently I came up with this delicious, smoky southwestern chicken concoction. 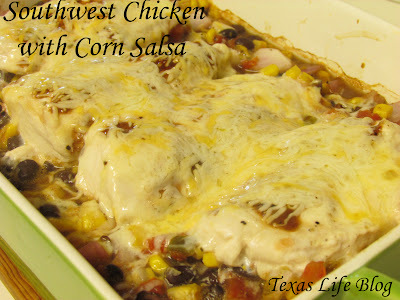 It's baked over a corn salsa and is absolutely delicious. The salsa is wonderful eaten cold with tortilla chips, as well. 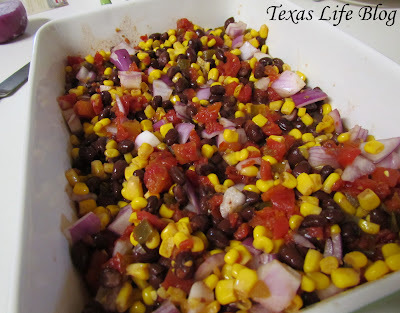 The crunchy red onion is a refreshing addition to the corn, black beans and Ro-Tel. 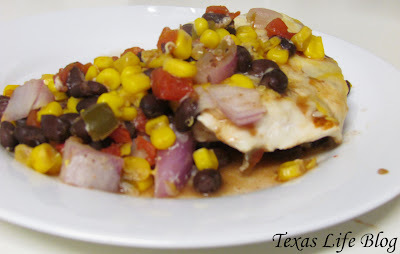 This would make a simply and tasty weeknight dinner... Great for those busy nights when you need to throw something together in a flash! 2. Combine black beans, corn, Ro-Tel, onion and 1 Tbs hot sauce;. Mix well. Pour into 9x13 pan. 3. Place chicken breasts on top of salsa mixture. Drizzle remaining hot sauce on top of chicken; sprinkle with black pepper. 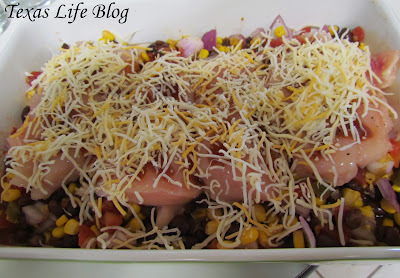 Top chicken and salsa mixture with cheese. 4. Bake for 25- 30 minutes. This is great by itself, but I have a feeling it would be delicious if you shredded the chicken and served it up over warm tortillas.